Aaron began yoga as a supplement to long-distance running and cycling. After enough events and a few miles, Aaron enjoys time spent improving his practice from the safety and cozy warmth of a yoga mat. Aaron stays active as a high school and college basketball official. Aaron is the co-studio owner of Sumits Yoga KC with his wife, Kim. Aaron and Kim are also the parents of twins. Aaron enjoys an array of music, from trombone to drums, a humming bowl, chanting and singing. 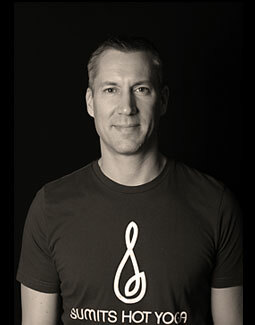 Aaron hopes that you will join him for his class, where his passion for yoga and music come together.